Whereas the number of treatment options in relapsing-remitting multiple sclerosis (RRMS) is growing constantly, alternatives are rare in the case of secondary-progressive multiple sclerosis (SPMS). Besides mitoxantrone in North America and Europe, interferon beta-1b and beta-1a are approved for treatment in Europe. Glucocorticosteroids, azathioprine, intravenous immunoglobulins (IVIG) and cyclophosphamide (CYC), although not approved, are commonly utilized in SPMS. Currently monoclonal antibodies (mab), and masitinib are under examination for treatment for SPMS. Hematopoietic stem cell transplantation and immunoablative stem cell transplantation are therapies with the aim of reconstitution of the immune system. This review gives information on the different therapeutics and the trials that tested them. Pathophysiological considerations are presented in view of efficacy of the therapeutics. In addition, therapeutics that showed no efficacy in trials or with unacceptable side effects are topics of this review. Paulus S. Rommer has served as a consultant for Bayer. Olaf Stüve has received grant support from Teva Pharmaceuticals; served as a consultant for Biogen Idec, Genzyme, Novartis, and Sanofi Aventis; had travel/accommodations expenses covered/reimbursed by Teva Pharmaceuticals; served on boards for Archives of Neurology and Therapeutic Advances in Neurological Disorders; and received fees for participation in review activities such as data monitoring boards, statistical analysis, and end point committees from Teva Pharmaceuticals. Greenberg BM, Balcer L, Calabresi PA, Cree B, Cross A, Frohman T, et al. 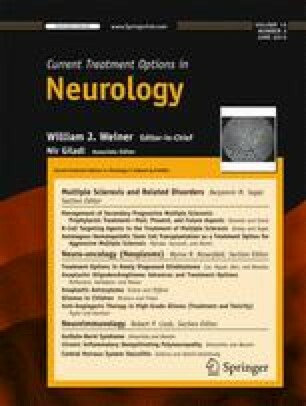 interferon beta use and disability prevention in relapsing-remitting Multiple Sclerosis. Arch Neurol. 2012;1–4: doi: 10.1001/jamaneurol.2013.1017.